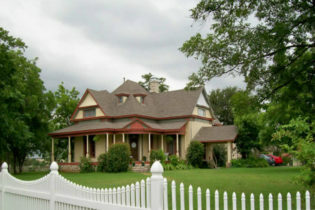 Victorian style home built in 1890, with themed and authentic decor, large front porch and deck for enjoying nature. A spacious sun porch and warm kitchen for visiting or enjoying a cup of coffee. 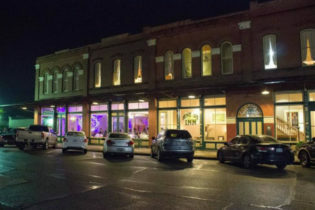 We are located in heart of downtown Llano, close to local shops and our ever famous Llano river. Ideal for hunters who come to the area for great game or traveling tourist who come for the festivals. We offer personalized breakfast or brunch included with your stay. Each room, except our Garden room, offers an on-suite bath, closet space and/or dresser for your stay. The Conductor’s suite offers a private entrance for your ease of coming and going during your stay. We provide cable tv, wifi( upon request) and breakfast or brunch from 9 a.m.-1 p.m.
A.B. 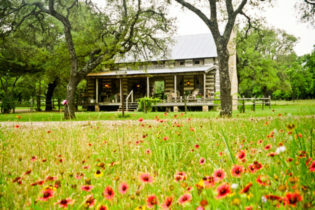 Butler’s Dogtrot at Triple Creek is an authentic 1800’s log cabin, redesigned as a romantic Fredericksburg, Texas bed and breakfast rental in the heart of the Hill Country. A.B. 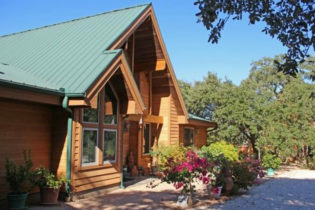 Butler’s Dogtrot at Tripple Creek log cabin bed and breakfast in Fredericksburg, Texas offers romantic and historic accommodations for your special occasions. 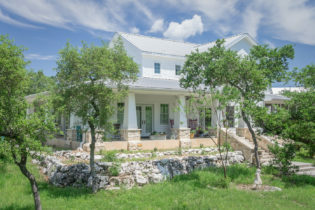 Just minutes from downtown on relaxing Hill Country acreage, our historic Fredericksburg bed and breakfast has appeared in two national magazines. The 200-year-old log cabin suite offers antiques, designer fabrics, king-size bed, Jacuzzi tub, and a romantic atmosphere to its Fredericksburg bed-and-breakfast guests. Welcome to Texas Hill Country's Alexandra's House! 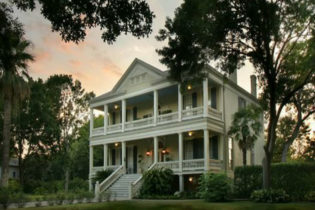 has beautiful wood floors, antiques and art throughout, and a great porch area for each room, along with private bath. There are many wonderful breakfast combinations that we will choose from. Everything is homemade, and herbs from the garden are often used. Located on five acres of rustic woods, we are less than 10 minutes from the arts and crafts in Wimberley, and less than 10 minutes from the famous outlet malls in San Marcos. 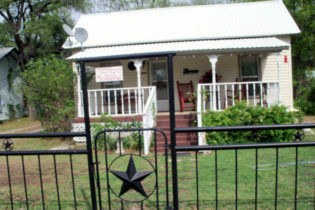 Holly Hill Homestead B & B offers a relaxed atmosphere in the beautiful Piney Woods of East Texas. Your hosts are known for genuine Southern hospitality, and are committed to offering a personal alternative to chain hotels, and making each guest's stay special. We offer 2 rooms as well as a separate cabin - and please inquire about additional sleeping space in the house. 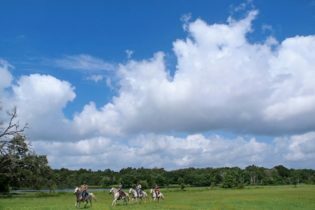 We are close to Daingerfield State Park, Lake O' the Pines, and Historic Jefferson, as well as biking & hiking, boating, and wine tasting at local vineyards. Holly Hill Homestead B & B is a charming farmhouse surrounded by herb and perennial gardens, offering a tranquil escape from the daily grind. Wake up to wonderful aromas of fresh-baked herb bread, pies, and pastries coming from the big country kitchen. Located in the Piney Woods of Northeast Texas, this property is beautiful year around. Parker’s Crossing Cabin is a fun and private retreat just across the field from the farm house. You will enjoy the quaintness of the decor and comfortable cozy feeling. Rental of the cabin includes a full hot breakfast delivered to your door or served at the farm house. There are festivals and activities in our area year around. Daingerfield State Park is just minutes away and the city of Jefferson TX is only a short drive as well as Music City Texas in Linden. We are located 3 hours from Dallas, 1 hour from Texarkana, and 1 hour from Shreveport, LA. The Inn on Lake Granbury is a lakefront Granbury bed and breakfast with beautiful views, 3 acres of landscaped gardens, and upscale accommodations just 45 minutes from Fort Worth. This lakeside retreat features a variety of lodging options including elegant rooms, luxurious suites, and fully-furnished guest house rentals. We also have a saltwater pool with waterfall and a conference facility. We frequently host business meetings, family reunions, and weddings. Try our Wine Lovers Package for the perfect date night! At our lakefront retreat, Inn on Lake Granbury, you’ll experience upscale accommodations, comfort, and personal service – all within short walking distance to shopping and fine dining on Granbury’s Historic Town Square. It is less than a 2-hour drive from Dallas and 45 minutes from Fort Worth. 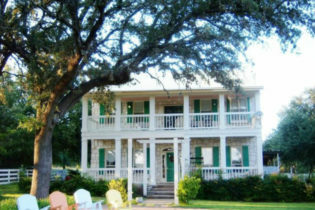 Enjoy a vacation filled with relaxation in one of the unique accommodations offered at the Inn on Lake Granbury. All rooms, suites and house rentals feature hardwood floors and European decor with Hill Country accents. You’ll enjoy the heated bathroom floors, steam showers, stone fireplaces, and outdoor porches and balconies. A getaway to our Texas Hill Country inn includes a five-course breakfast, as well as our complimentary afternoon wine and appetizer hour. Imagine a romantic walk down winding pathways to the edge of Lake Granbury or perhaps relaxing on the bluff beneath stunning live oak trees overlooking the lake. There is a plethora of activities and attractions within a short distance of the inn. Enjoy outdoor activities, live theater, fine dining options, and Texas Hill Country wine tours. 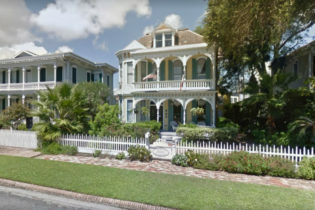 The Lost Bayou Guesthouse a historical Bed and Breakfast with country flair is centrally located in Galveston, Texas to the beach, shopping, cruise terminal & restaurants. The guesthouse offers our guest a tranquil setting for relaxation, rest, and recuperation. 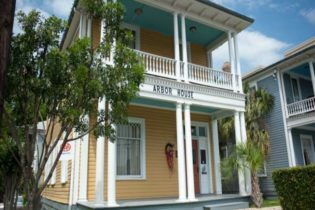 Built in 1890 and a survivor of the great hurricane of 1900 the Lost Bayou Guesthouse Bed and Breakfast is located in the Lost Bayou historic district, in the city of Galveston Texas. The guesthouse is located within walking distance to the beautiful beach. We are only a short distance from the historic downtown Galveston Strand with its many shops, theaters, and delicious restaurants. We are also located close to the Galveston cruise ship terminal. 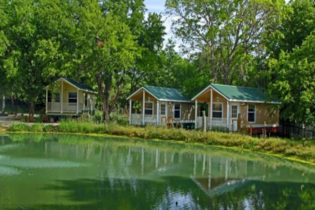 The Lost Bayou Guesthouse offers a relaxing environment with country flair and a lot of fresh air from the Gulf of Mexico. 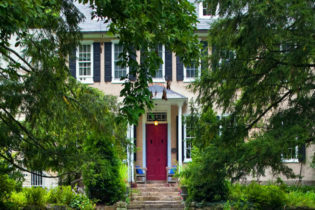 With 5 large bedrooms this centrally located historical bed and breakfast can accommodate a large family or group gathering up to 14 guests. Bedrooms are modestly furnished with elegant decor and firm comfortable king and queen size beds. All rooms have large windows to let in the morning light and to provide a great view. You will find a large bathroom with a shower that is big enough for three or four. We look forward to seeing you!! Welcome to the Sage Hill Inn & Spa located in Kyle, TX offering a world-class restaurant, ninety acres, twelve buildings, massive views, woods, bluffs, miles of trails and an enormous pool, deck, hot tubs and fire pits. Sage Hill Inn & Spa sits atop a hill on 88 acres above Onion Creek, in Kyle, TX with sweeping views of the Hill Country to the West. 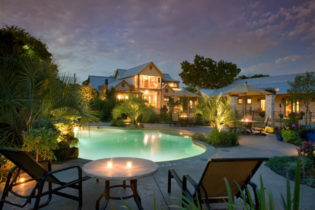 The location offers beautiful views of the Hill Country, the ideal setting for a romantic Texas getaway. The sunsets are spectacular and because the night sky is unimpaired by city lights, you can enjoy a sweeping view of the stars. Our bed & breakfast land is rich with wildlife including: deer, black buck antelope, wild turkey, foxes, raccoons and abundant bird life. 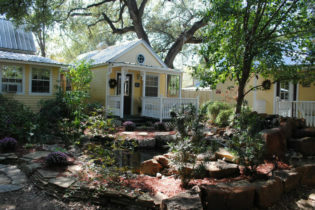 Take a look at our extensive Photo Gallery to get a better picture of our Hill Country getaway! If you’d like to see some of the recent press from Forbes, Austin Monthly, Texas Home and Living, the Statesman and more, take a look at our Recent Press page! Located in Christoval, TX along the banks of the South Concho River, The Coach House Bed and Breakfast, is an early Texas dwelling tastefully decorated with antique furniture. Located in Christoval, TX along the banks of the South Concho River, the Coach House Bed and Breakfast, is an early Texas dwelling tastefully decorated with antique furniture. You will be taken back in time to a lifestyle of simplicity, while having the amenities of today. If nightlife or shopping malls peak your interest, then San Angelo, TX, is only 14 short miles to the north. While in San Angelo, plan to visit Ft. Concho. It is on the Texas Forts Trail. So, “Come to Christoval where a river runs through it and experience life as it was at the turn of the century”! We are waiting to serve YOU! 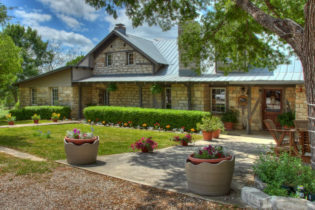 The Inn offers six acres of beautiful landscaped gardens located in the middle of a small town, yet only a short drive to Fredericksburg, Wimberley, Marble Falls, Austin and San Antonio. 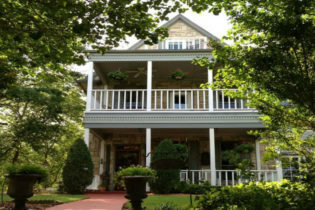 Chantilly Lace Country Inn is located in Johnson City, Texas, the crossroads of the Hill Country. A short drive to Fredericksburg, Wimberley, Marble Falls, Austin and San Antonio. 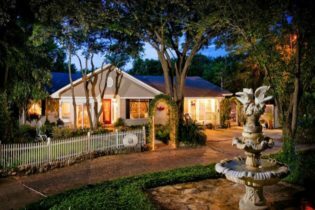 Visit all the beautiful sites of the Texas Hill Country and return at night to the peaceful beauty of the Chantilly Lace Country Inn Bed & Breakfast. The Inn offers six acres of beautiful landscaped gardens. Located in the middle of a small town, the Inn offers a beautiful setting for relaxing outdoors. Herb gardens and perennial beds are connected with winding paths that lead to private benches, perfect for enjoying tea or for quiet reading. Three porches and a pavilion are available for our guests, offering the opportunity for intimate conversation. Comfortable furnishings, including a porch swing provide an array of seating for our guests. Overhead a unique variety of mature trees provide cooling shade in the summer. A gentle breeze may bring the sound of wind chimes. In the spring and summer, there is an abundance of butterflies and hummingbirds that make Chantilly Lace Inn their home. 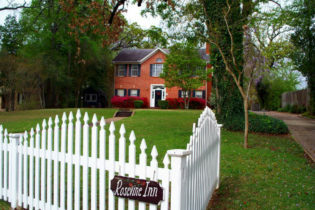 We invite you to relax and getaway from it all at our Jefferson, Texas bed and breakfast. 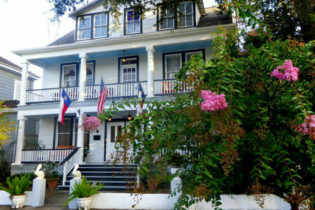 White Oak Manor Bed and Breakfast is located on a quiet street and is just a short walk to the downtown historic district. 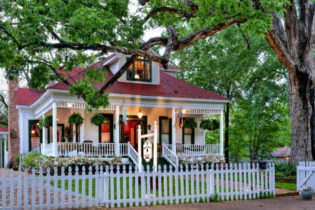 PIXWhite Oak Manor Bed and Breakfast is a turn of the century Greek Revival home conveniently located near downtown Jefferson, TX. Come and unwind on the wrap around porch and enjoy true Southern Hospitality. The guest rooms are beautifully appointed with a clean and comfortable environment. It’s an affordable inn with an ideal location that welcomes travelers with the warmth and charm they would usually only find at home. The guest rooms are a nice size, airy, bright and each with their own bath. Come enjoy Old Fashioned Hospitality with Modern Convenience with a stay at the Woodrow House in Lubbock, TX. Woodrow House Bed and Breakfast is a beautiful, spacious 10 room Bed and Breakfast located across the street from Texas Tech University. We have ten rooms, all with private bathrooms. There are two full suites and a actual Santa Fe Caboose you can stay in. The main house has 7 rooms for you to enjoy. 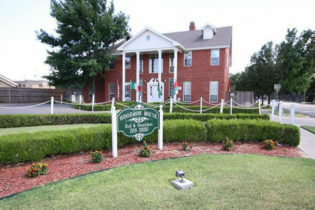 Woodrow House Bed and Breakfast is within walking distance to virtually all Texas Tech University events and activities. When planning your next visit to Texas Tech University, Lubbock Texas, or visiting the Buddy Holly Center, remember the Woodrow House Bed and Breakfast. We’d love to have you stay with us.